It’s been a real challenge turning our financial situation around. My husband seems supportive but he’s having a really hard time breaking his old spending habits and with our reduced income it is really a challenge every month. I finally was able to get about $300 together for an emergency fund and I was really happy with my progress when our hot water heater died. We had to replace it and it not only ate all of our emergency fund but put us a few hundred deeper in debt. It feels like every time we start to get ahead we end up further behind. Connie nailed it. One of the most common reasons for the failure of short term financial plans is a key appliance failure. I’ve seen it happen in my own life, when our own hot water heater failed a couple of years ago and our washing machine failed about three years ago. The appliances in your house are not infinitely reliable. An appliance failure is going to happen in the future. There’s never a good time for an appliance to fail. It will always cause difficulties that eat up our time and energy and add to our stress level. However, it doesn’t have to add to our financial stress. Our solution to this challenge is really simple. 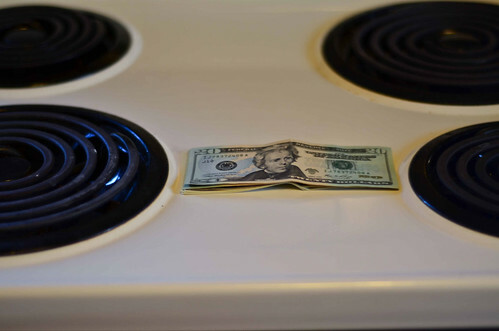 We simply automatically save $10 a week for appliance replacement. That $10 a week turns into roughly $525 per year. That’s enough to replace a washing machine or a dryer with an economical model. Over multiple years, that money will grow to enough to replace even major appliances, like a central air conditioning unit or a furnace. We started this fund after our hot water heater failure depleted a piece of our emergency fund. We’ve put in $10 a week as well as a bit of extra “found money” along the way. It has just shy of $1,000 in it. What will happen the next time an appliance fails? We just go replace it, then take the money out of that account to cover it. It’s as easy as pie – no financial stress, no mess. Appliances will fail. It may be an emergency, but it’s not something you don’t know about in advance and can’t plan for. You can plan for this, and it doesn’t take a whole lot of money each week to plan for it. $10 a week is a few beers or a few morning coffees. It’s one dinner you make yourself instead of getting a pizza. What does it transform into? It becomes not having to stress out if an appliance fails. It becomes not having a sick feeling in your gut if your washing machine begins to make a bad noise. It becomes not having to go into debt if your air conditioning unit bites the dust. It becomes freedom, in other words.